Every page in this book surprised me with new secrets that made me cringe. Each story seems so far-fetched, but still made me want to give Hannah a hug. Surprisingly, the most depressing part of this book is not about the suicide, but about one certain night; one certain party that changes everything. Deeply embedded in the text of this book is a moral: everything you thought you knew can be wrong. This book taught me to look for something that isn’t obvious, something that seems to be almost invisible. Hannah needed someone, and nobody knew. Jay Asher knows how to write in such a way that makes your heart twist into knots. 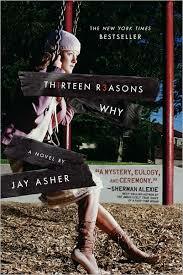 Thirteen Reasons Why had me reading late at night to avoid being driven insane by suspense. Every time I finished a chapter, it left me with questions, and empty answers that could only be concluded on the next cassette. One thing is for sure, I may never see people the same way.